playing on the newest dev build of dolphin as of today. Playing through Xenoblade, i am noticing that after playing for about 10 minutes my framerate starts steadily dropping until it sits at about half of what it should be. When i jump into the game, it runs at 100% (or higher if i unlock the framerate) but after a while it slumps until its a stuttery mess. Is this purely because my hardware is unfit for this game? Any mac users have any tips about settings for this game? surprisingly i actually do have a valid warranty, because i bought this computer refurbished. Do you think this performance drop is a valid concern to raise to the apple people? Apple systems aren't great for Dolphin anyways. Not much you can do beyond booting it in windows, hope for better performance, and maybe make sure you can get some proper ventilation. Just replace your laptop's thermal paste with sth like Arctic MX-4 or IC Diamond 7 . OEM thermal paste is much worse than aftermarket one , OEM thermal paste die quickly within a year . 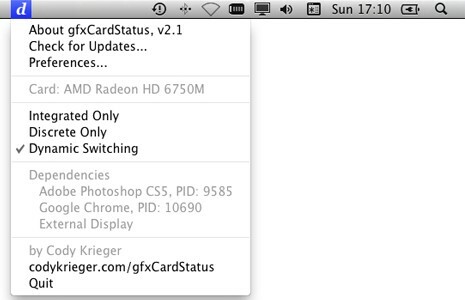 as per gfxcardstatus, i don't think you actually have to do that, as you can set your main graphics card to default under power save settings. anyway, curse this laptop, im definitely going to complain to apple that i can't use programs that my machine meets the requirements for. Complain to them that it overheats and your performance goes down, they may actually do something.